Back in April, I speculated that Google would acquire ITA Software, the meta-search technology that drives online travel agents (OTAs) in addition to Bing Travel, and could throw a monkey-wrench into how online search would function going forward. 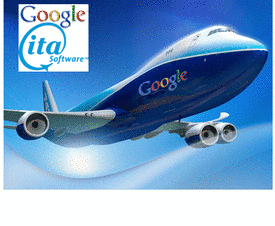 In my post, titled, "Google & ITA Software Could Be Game Changers for OTAs. . ." I noted industry sources that predicted the buying price could go as high as US $1 billion. Since that time, the acquisition did take place but at a much more modest price tag of $700 million. This has caused a wave of concern throughout the travel industry, and OTAs are fighting back, fearful that travel search would fold into the monolithic search giant's control, stifling competition. According to a NY Times report, a coalition of Expedia, Kayak and Microsoft have formed FairSearch.org to request that regulators thwart the deal before Google takes any further action. While Kayak is in the process of filing its first public offering, it noted that a combined Google-ITA could present a major risk to its future success. 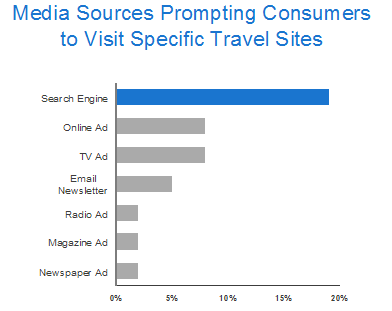 Back in April, Google referenced a Juniper Research study that clearly demonstrated that travel searches had surpassed online and TV ads as the number one source for determining travel sites by consumers. Other OTAs are less aggressive in attacking Google and are taking a wait-and-see approach. While Orbitz stated publicly that it's neutral on the deal, Priceline's president suggested that Google's entry into the vertical market of travel could be an opportunity. The NY Times report noted that Google has no interest in setting up its own OTA or would even consider the sale of airline tickets. For its part, Google assures the OTAs that it will honor the existing ITA agreements and contends the acquisition will make comparison shopping for consumers easier and in the long run will drive more of them to airlines and OTAs. However, since ITA powers the sites of Bing Travel, TripAdvisor, Orbitz, Kayak, Hotwire, CheapTickets and dozens more - travelers don't really care who they are booking with as long as they get a deal. From this perspective, Google could devise a commercial means to direct business - if not to their own OTA - to preferred vendors it partners with. Airlines, hotels and travel destinations could essentially pay Google for search rankings - as they currently do with other vertical markets based on their keywords and paid search models. Tim WuIntegrating the ITA engine into the main Google search page would be a major game-changer for all parties concerned. As Tim Wu, author of "The Master Switch" and architect of the term 'net neutrality,' noted, " Google likes to enter markets where it thinks the existing approaches are broken, and (then) tries to do a much better job." To date, this approach has not worked in the social media space - but it has worked remarkably well with Android phones as it continues to go head-on-head with Apple's iphones. Google's future in travel will most likely be played out in 2011 and if OTAs are directly affected, I am sure there will be more lobbying put in place to stop the Big G from becoming the dominant player. Your thoughts, readers? Google will be able to offer improved flight search results and gain influence in the travel search market but not control it. Fare search is far from broken and existing players offer very effective solutions. The enhanced hotel search results Google offers are a model of what will happen in fares. The actual transactions will still be handled by existing OTAs and suppliers. As far as I am concerned, Google already controls the travel market. Like Microsoft of old, Google is the big player and it rules the internet. I think this will vary from country to country. In the UK, and in other European countries, most people book holidays from package tour operators as opposed to flights, transfers and hotels separately. UK tour operators are all government bonded so if they should go under, people who have booked get their money back and those on holiday at the time are guaranteed flights home. So, booking flights, transfers and hotels separately, looking for deals using such things as Google and Trip Advisor, which I don’t regard as very credible anyway, is not only more complex it is also more risky. I don't think Google is going to make much of an impression in this market. It looks more like a US play to me. 1. Diploma in Travel & Tourism – This 4 month course offered by Akbar Academy gives you the skills necessary to work at the counter or Sales & Marketing departments of Travel Agencies and Airlines. 2. IATA/UFTAA Foundation Course – It takes 5 months to pass the IATA course. This is an internationally recognized qualification for Travel consultants with great job opportunities.